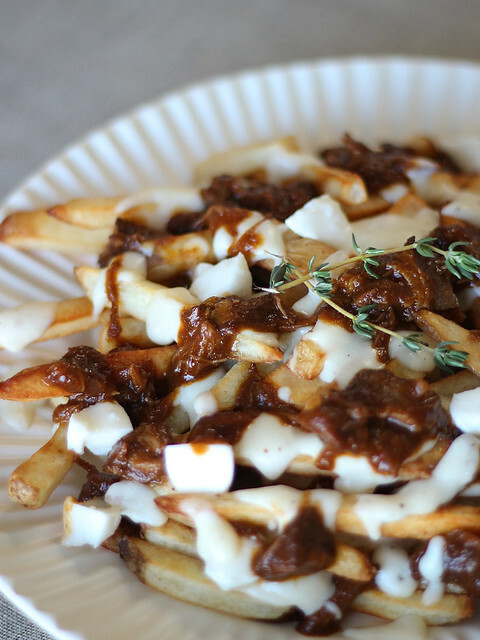 But this poutine recipe is extraordinary — it ain’t no fast food fare. Inspired by Salt House — a cozy, bustling restaurant in the SoMa/Financial District of San Francisco — it tops fries with a creamy gruyere and Parmesan cheese sauce (Mornay), mozzarella cheese curds and short rib gravy. To make this, you’ll need to cook up a batch of braised short ribs and save some of the reduced sauce and meat, but trust that it’s so worth the effort. If you don’t feel like making poutine within a day or so of the short ribs, just freeze the exact amount of leftover meat and sauce needed in a Mason jar and heat it up when the mood strikes! Bake fries in a preheated oven according to package directions. Once fries are cooked, turn off oven and leave them in it to keep warm — they shouldn’t be in the oven too long before the toppings are ready, but keep an eye on them to make sure they’re not getting to browned or crisp). Once the fries are in the oven, heat short rib gravy. In a small pan over medium heat, combine reduced short rib sauce and meat. Heat, stirring occasionally, until simmering; reduce heat to low, continuing to stir, until ready to plate. About 5 minutes before fries are done, make Mornay sauce. In a small saucepan (2-quart), combine butter through pepper. Set over medium heat and whisk occasionally until butter is melted and mixture begins to foam (about 30 seconds – 1 minute). Pour in about 1/2 of the milk, whisking rapidly. Once thick and smooth whisk in the remaining milk. Bring mixture to rapid, full simmer, and continue to cook until the mixture coats the back of a wooden spoon and when you run your finger through it a distinct track remains. Immediately remove from heat and add cheeses, stir constantly until cheese is melted. Immediately proceed to plating! Arrange about half of the fries on a large serving platter. Top with half of the short rib gravy, Mornay and mozzarella. Repeat with remaining fries, etc. Serve immediately! ¹ I use Trader Joe’s handsome cut potato fries. Typically, I bake them at 475° – 500°F (or 450°F on the convection setting) for about 10 – 12 minutes on a parchment-lined, large rimmed sheet pan. You may also make fries from scratch, preferably using Kennebec potatoes for an even more authentic Salt House experience!